Alex had brought the new expansion for Five Tribes that, among other things, adds an extra tribe. It also adds a bunch of extra tiles, expanding the size of the playing area, and walls that can be placed between tiles to block movement. And probably some other things. 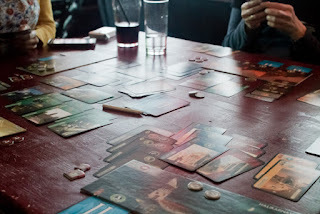 This week I came armed with 7 Wonders and got straight down to it. 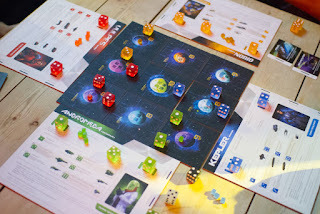 We played just the base game as it was new to some of the people. There were five of us playing and it ended up with me and Gemma tying for first place. We played our second game with Philip and Mike joining us for the full compliment of seven players. It was Philip's first ever game but he ended up winning it. Afterwards he admitted that maybe he'd made a couple of mistakes and played some cards that maybe he shouldn't have been able to. But everyone makes mistakes and it's only a board game so who cares, right? Because everyone had fun and winning is just a thing that happens after the anti-climax of adding up the scores. The others were playing Spyfall, One Night Ultimate Werewolf and Warewolf. 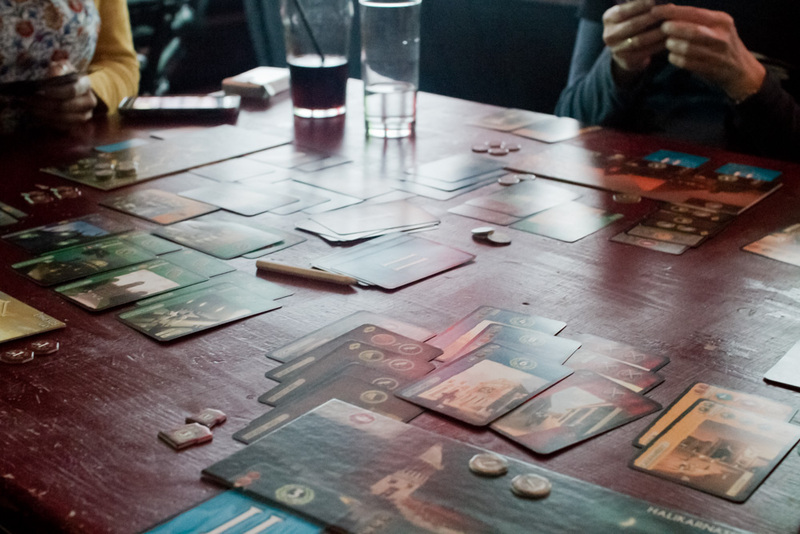 Afterwards 7 Wonders we played Spyfall ourselves. Has it already lost some of the appeal that it'd had last week? I'm not sure, maybe a little, but it's still very good. There were a few games where the spy got caught out straight away. For example we were on the train and by total luck within the first few turns the spy was asked if they were moving and they said no. It was immediately obvious they were the spy and the game was over. But that's not necessarily a problem, it creates a funny moment and we just start a new game. Afterwards we played a quick game of Coup followed by a quick game of Yardmaster Express which I'd recently bought the Caboose expansion for, which, although doesn't add much, adds some well needed variation to the caboose cards that add bonus points for creating certain combinations of carriages, etc. I left with Mike, Alex, Dan and Joe finishing up a game of Quantum.